Content Grabber provides an Agent scheduling facility that enables you to automatically run your agents at predetermined time slots whenever you need it to run. This can be done every hour, every day, month, year and so on. You can schedule agents using the Content Grabber Scheduler or the Windows Task Scheduler. We recommend you use the Content Grabber scheduler for new agents, since it provides more advanced features and integrates more tightly with the rest of the Content Grabber application. 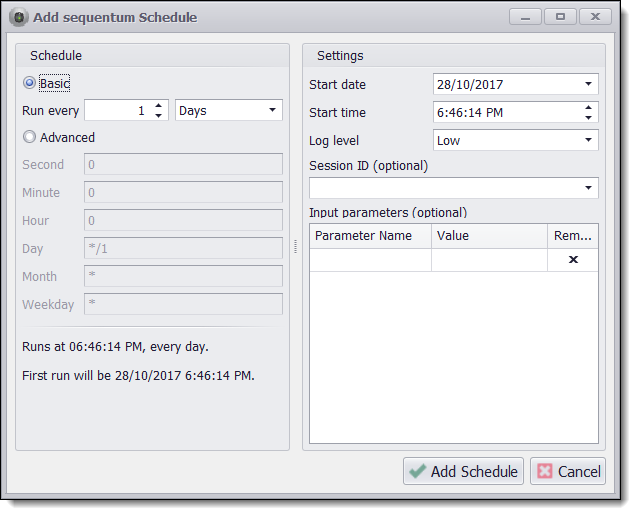 The Windows Task Scheduler integration is provided for backward compatibility. If read the topic Windows Task Scheduler if you prefer to use this scheduler. If one or more schedules already exist for the current agent, a Window listing all schedules will open, and you can edit existing schedules or add more schedules from there. The Content Grabber Scheduler uses Cron expressions to define when the scheduler should run an agent. If you setup a basic schedule, Content Grabber will automatically convert the basic schedule into a Cron expression. When you edit an existing schedule, the Cron expression will always be shown, but you can simply switch back to the basic schedule if you don't want to work with Cron expressions. Please read the topic Cron Expressions for more information about Cron syntax. The Scheduler depends on the Content Grabber Windows service, and the service must be running for the scheduler to be operational. If the service is not running, a message will be displayed at the top of the Scheduler Windows with a link allowing you to start the service. We recommend you configure the service to start automatically when your computer starts. 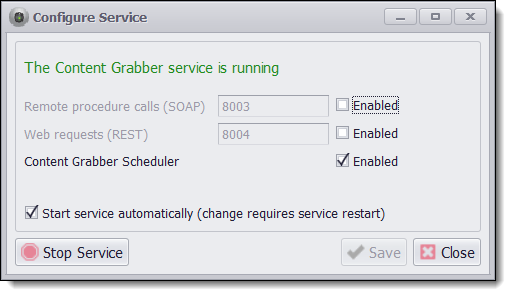 Make sure the Content Grabber scheduler is enabled before you start the service. Remote procedure calls and Web request are used by the API and are not required by the scheduler.